When I first learned how to do word studies I found them to be quite daunting. There was always a wealth of information and I never knew where to start. Of all the challenges I faced, the problem I had most often was picking the “right” word(s) to study from the passage I was reading. Not to mention, would the lexicons I had help me or even mention my verse? If that’s you, or you’ve been there before, I want to show you how Vine’s New Testament Word Pictures can make your word studies easier. The honest answer is maybe, but I strongly believe both are worth owning. While there is a lot of overlap between the two resources, the way you use each is completely different. They are built to complement one another. The best way to think about them is like this: Vine’s Dictionary is a dictionary, whereas Vine’s Word Pictures is a commentary. So, let’s dive in and see how the two work in harmony. 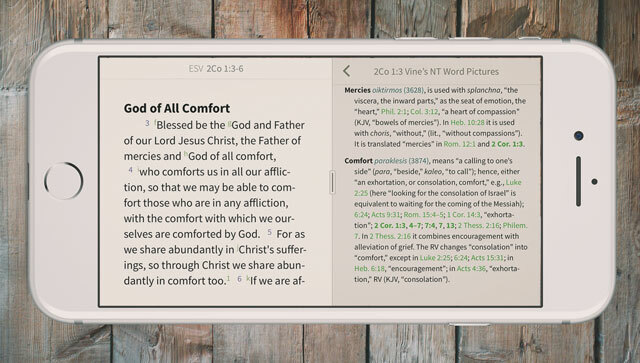 To illustrate how Vine’s New Testament Word Pictures works we’re going to use the ESV Bible and 2 Corinthians 1:3-7 as our passage, inside the Olive Tree Bible App. As you can see, there’s a lot going on in this passage about comfort, suffering, and affliction. Where do we even begin?! This was one of the problems I had when learning to do word studies. This time, instead of getting overwhelmed, we’ll let Vine’s help us out. With the split window open, you can open Vine’s Word Pictures in the second pane. 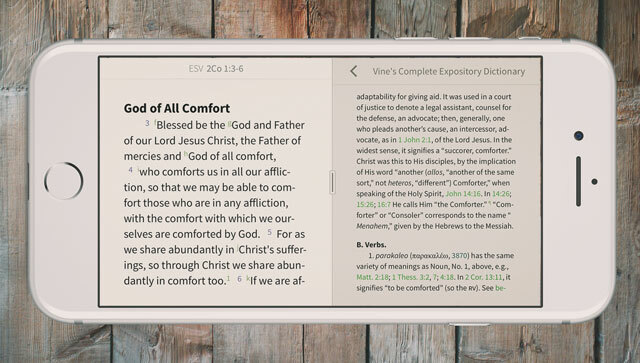 Since this resource functions as a commentary it will follow wherever your Bible goes. One thing you’ll quickly notice about this resource is that it’s not like a normal commentary. There are no textual notes explaining the meaning of the passage. That’s what your other commentaries & study Bibles are for. Instead, what you get are the key words contained in each passage with definitions, theological significance, and clear cross references. You no longer have to guess which words to study because they are put in front of you. In this screenshot you can see a few key words include: mercies, comfort, and tribulation/trouble. Given the emphasis of this passage, these are words I’ll certainly want to study further. I love cross references and Vine’s Word Pictures is not shy about providing them. 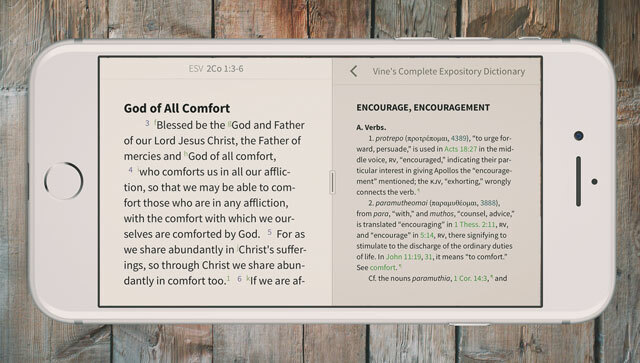 The Olive Tree Bible App makes it easy to tap on the reference so you can read it without losing your place. Another bonus is that cross references within the same book of the Bible are boldfaced so you can take particular note of them. Where this resource really shines is its Strong’s linking. Most words that are discussed also contain a transliteration of the corresponding Greek word and its relevant Strong’s number. These are tagged in the app so you can tap on them and get more information about the word you’re studying. Within the pop-up, you get the definition from the Strong’s dictionary, which is where Vine’s Dictionary comes into play. Let’s say the word “comfort” has caught our attention in this passage. We’ve read the entry in Vine’s Word Pictures, looked at the cross references, and perused the Strong’s pop-up. What next? Simple, let’s go to Vine’s Dictionary. The quickest way to get there is to tap the Strong’s number and then select the “Lookup” button at the bottom of the pop-up. From there, we can find the dictionary. Unlike most lexicons and dictionaries, the nice thing about Vine’s is that it groups the original language words together based on their English translation. For us, this means that in our study on “comfort,” we can go to the dictionary and get more than just information about our word’s usage as a noun. Here we see additional material, such as Greek synonyms we may want to include in our word study, as well as the verb form of the word. Not to mention, if there are other ways it is translated into English, we can get to those as well. 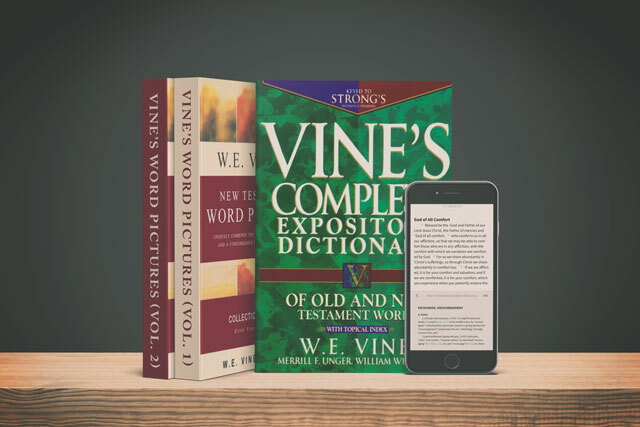 Get both Vine’s New Testament Word Pictures and Vine’s Complete Expository Dictionary today and improve your word study. 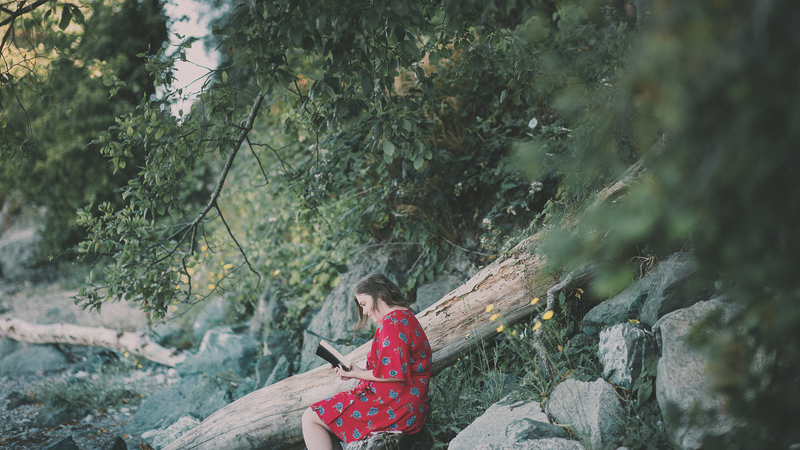 Not only will you save yourself time, but you can rest assured that you’ll never miss an important word again. 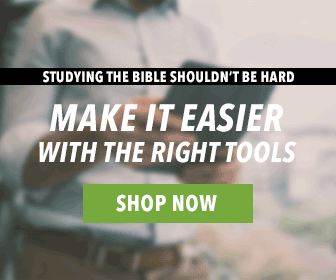 Great resources, getting the original meanings of words used in the Bible helps us understand better. Taking into consideration, the history behind these words as well.